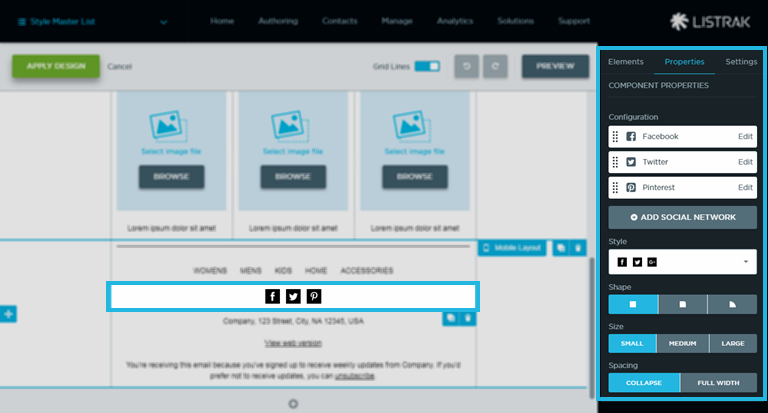 Learn more about how to add Social Icons in Listrak Composer. You can include easy-access social icons to each of your social media sites by following the below steps. Drag and drop a Social Component onto the canvas. Click Edit to modify each social network. Enter the link URL to your social media site. Add more networks by clicking Add Social Network. Remove social networks by clicking Edit. Layout and styling includes style, size, shape, and spacing. There are a few style options to help you get started, but custom icons can also be added by following the below steps. Choose BROWSE to upload or select an image from the media library, or choose Image Source to enter an image from the web. Image size must be 96 x 96px.